Nothing quite beats the comfort of swaying in the breeze by yourself or with a loved one on a comfortable hammock during the summer afternoons. This Portofino Comfort plush, quilted hammock bed is wrapped with durable Sunbrella® fabric that stays vibrant under UV rays and dries fast after a storm. By pairing the bed with a durable crescent arch cypress wood frame, you can let go of any worry you may have about finding the right trees to anchor your bed on. The endurance of this set invites you to unwind on this piece for years of enjoyment. Quilted bed includes a built-in bolster pillow for added comfort. 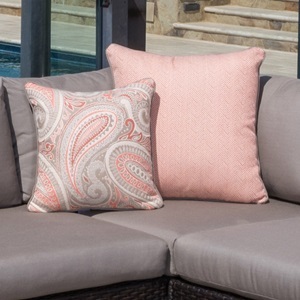 Outdoor engineered polyester fabric is UV, weather, and color-fast fade resistant. Strong and durable laminated cypress wood frame. Elegant and timeless crescent arch design. Virtually maintenance free, simply rinse clean with a hose and mild cleanser. Coordinates with the Portofino Collection by RST Brands. Ergonomically contoured to fit to your body. 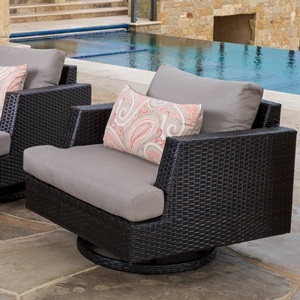 Strong and durable laminated cypress wood frame engineered for outdoor use.